For over a decade, there has been great deal of buzz around the term “Big Data.” This term was coined in 2005 by Roger Magoulas from O’Reilly Media to refer to the mass amounts of information that businesses collect on a daily basis that cannot be easily processed and analyzed with traditional software. Companies aim to harness these large data sets in order to gain insights about their customers by investing copious amounts of money in Big Data and business analytics software. In fact, Forbes estimates that worldwide software revenues will grow from $122B in 2015 to $187B in 2019, growing by more than 50% over a five-year projection period. It is safe to say that Big Data has been viewed by some as a “genie in a bottle” that will allow a company to understand the customer, and lead to prosperity. However, while customer insights—especially those your competitors do not have—can lead to business success, Big Data does not deliver these insights on a silver platter. There is a step that can be easily overlooked—asking the question, “why?” Why are my customers behaving that way? Big Data can effectively explain consumer behavior, but it can easily miss the consumer motivations that drive the behavior. Put simply, Big Data only shows the tip of the iceberg—sometimes the insight can be hidden under the surface, and companies must seek it with qualitative research. A way to discover these insights that are hidden under the surface is through “Thick Data”. Thought leaders, Christian Madsbjerg and Mikkel B. Rasmussen popularized this term in their 2014 book, The Moment of Clarity. 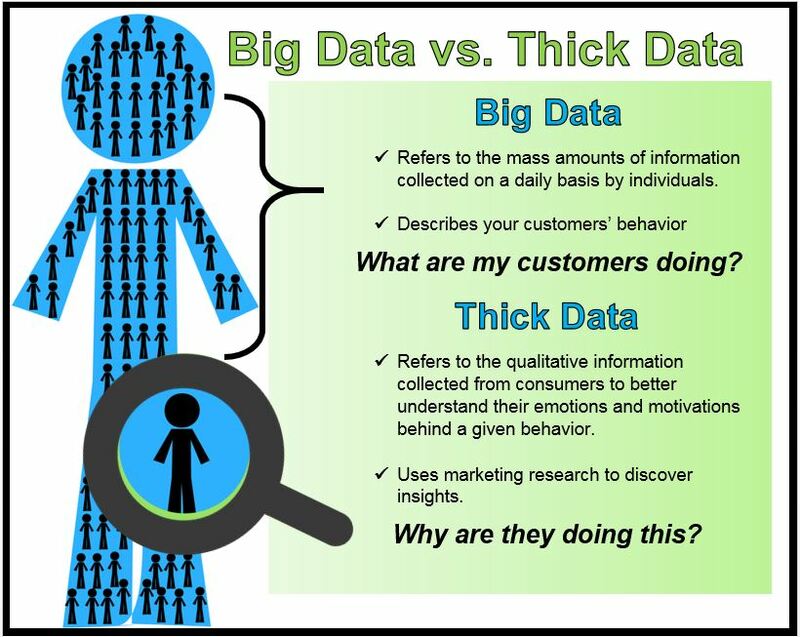 They explain that Thick Data is qualitative information collected when companies try to “understand the emotional, even visceral context in which people encounter their product or service.” This information can be gathered through observational research like ethnography, interviews, and surveys—research that looks at the customer on an individual level. In order for companies to effectively develop insights, they must collect Thick Data in combination with Big Data. After watching hundreds of interviews and videos, and looking at other artifacts (collecting Thick Data), the team found that people were commonly hiding their clunky TVs in corners, or mentioning how they wanted their television to look. Madsbjerg and team discovered a pattern; people did not think of their TV just as technology, but also as furniture. From this insight, Samsung redesigned their televisions to be more aesthetically pleasing to their consumers by creating a modern look with its speakers and wires out of view, leading to better differentiation. It is clear that this insight could have been generated by Big Data alone, but by also using ‘Thick Data’ they were able to understand their customers’ needs and serve them more effectively. In summary, before companies decide to invest millions of dollars into Big Data campaigns, they must realize that some resources will need to be allocated to Thick Data as well. Big Data is directional and shows consumer behavior, but it does not show the whole picture. To get to the heart of the customer and really understand their motivations, attitudes, and perceptions, companies must collect Thick Data. By using today’s Big Data technology in conjunction with Thick Data, organizations can more effectively develop the insights that they seek, and then utilize them to better satisfy their customers and lead their business to greater success.